These are products we always have available unless otherwise noted . Sorry but we are unable to stock stained glass at this time. If you would like a stained glass suncatcher, they are available on Barb's etsy site: www.faithlady.etsy.com. We have foil in silver, black and copper backed, in sizes 3/16, 7/32 and 1/4 inches. Please specify when you order. We do not have Venture brand. If you need wave foil (scalloped) we will special order it for you. 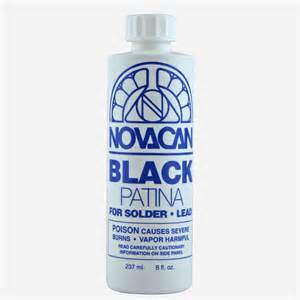 Novacan black patina for solder. Cannot be mailed. Water soluble flux, not paste. Cannot be mailed.